Even if, at a first glance, the answer might seem quite simple, we decided to analyse it in depth with a dedicated article. Let’s see in detail the two alternatives available to make sure that our stove heats not only technical water for radiators but also the water required for showering or washing dishes (domestic hot water). The kit for the instant production of domestic hot water (DHW kit) is mounted as standard or added as an option to hydro stoves with greater power, from 20-22 kW upwards. It is basically a heat exchanger that allows the heat of technical water to be transferred to domestic hot water. The kit usually consists of a plate heat exchanger, a three-way valve and a flow switch. The cost of a domestic hot water kit, even when it is optional, is quite low and generally amounts to about 150-200 euros. Moreover, the kit is installed directly inside the stove, without taking up additional space. The actual instant production of hot water only takes place if the pellet stove is switched on and operating at full power. Vice versa, when the stove is switched off or set to minimum, we will have to wait for it to go back to standard operation. In this case, it may take five to thirty minutes before we have any hot water. Moreover, the water flow rate of a domestic hot water kit is of about 8-10 litres, which may not be sufficient even for a long hot shower. Even if these terms are often used interchangeably to refer to storage tanks, a puffer and a storage cylinder are not the same thing. The puffer is actually a storage tank for technical water intended for the heating system, whereas the storage cylinder (boiler) contains domestic hot water. However, the most advanced puffers, called "combined", also allow domestic hot water to be accumulated, keeping it well separated from technical water. There are two types of combined puffers: “tank in tank” and “pipe in tank”. “Tank in tank” puffers contain an internal tank that supplies the domestic hot water circuit. The capacity of this internal tank is not very high (up to 300 litres maximum), but it is easily enough in case of normal and not too intense use of hot water (a typical example: a family of four). The "pipe in tank" puffers, suitable for more intensive or professional use (e.g. hotels, holiday farms), contain a domestic hot water serpentine, which, thanks to a greater exchange surface, can guarantee an almost unlimited water flow. With a storage cylinder or a combined puffer, domestic hot water actually arrives instantly, whenever the user requires it, even when the stove is switched off. This not only increases comfort but it also allows substantial savings compared to the use of a hydro stove with a DHW kit. The stove switches on less frequently and pellet consumption is definitely optimised. The only disadvantages of a puffer or storage cylinder compared to a DHW kit are related to the cost and space required to install it. The cost for a simple type of storage cylinder amounts to about 1,700 euros and may exceed 2,200 euros for the most advanced combined puffers. 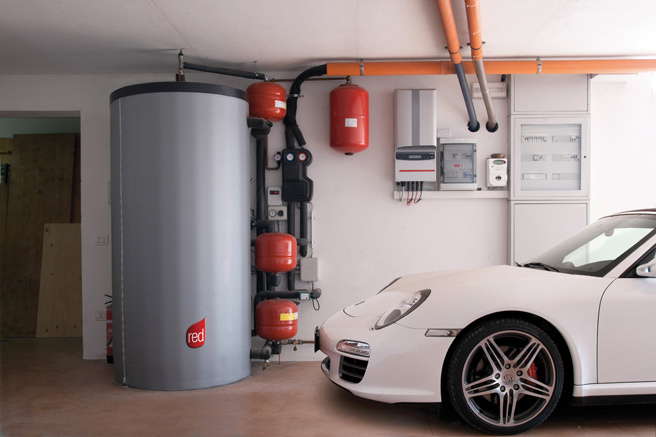 As for size, a 200-litre compact storage cylinder, such as this one by the RED brand, measures 61cm in diameter by 126.5cm in height (read more). It is therefore necessary to have a suitably sized technical compartment to house it. If you have adequate space and a sufficient budget, the winning combination will be a hydro stove combined with a puffer or a storage cylinder. In this case, the gain in comfort is unparalleled. 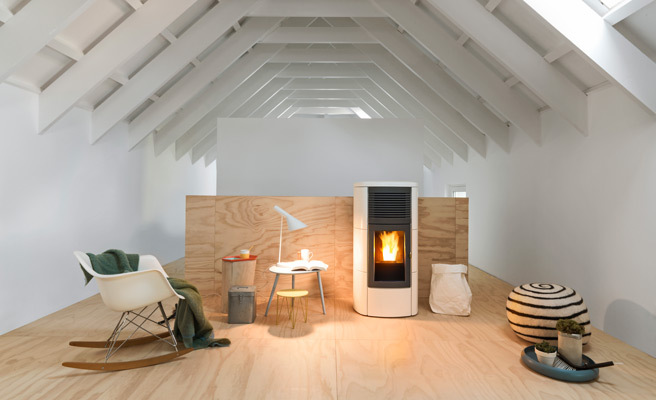 In the picture, Club Hydromatic by MCZ is a ceramic hydro pellet stove with innovative features, the result of several years of rigorous tests. It offers significant performance levels especially in terms of efficiency and emissions.